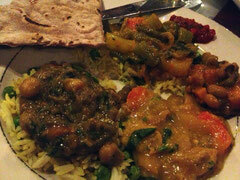 Our monthly ATL Vegan Drinks meet up was held this month at Panahar Bangladeshi Restaurant. We’ve met there once before and I really like the way they do it. Dinner is a flat price and everything is served family style. 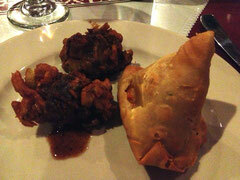 We started off with appetizers of pakoras and vegetable shingaara (samosa) with tamarind sauce. They were so tasty. The shingaara contained corn and cubed coconut as well as the usual samosa vegetables, which was super yummy. There were several entrees and each was as delicious as the next: Niramish - Mixed vegetable medley in a sauce with carrots, celery, cauliflower, green beans, potatoes, and zucchini; Mishtee aloo black eyed peas - Sweet potato prepared with black eyed peas and fresh tomatoes with chef’s special spices; Chaana begoon -Garbanzo beans cooked with roasted skinless pureed eggplant with tomatoes, grilled onions, garlic, ginger, turmeric, cumin and other spices; Mushroom moshoorer daal - Sliced white mushroom sautéed with lentils, roasted garlic cloves, grilled onions, turmeric, ginger, and other herbs and spices. Everything was served alongside motor-shooti polao - Aromatic baash-motee rice sautéed with green peas, grilled onion, raisins and a blend of herbs, rooti - soft unleavened whole-wheat baked flat bread and onion chutney - spicy homemade relish with chopped onion, peeled tomatoes, red chili powder, chopped cilantro and fresh lime juice. (Yes, I copied these descriptions from the menu.) My favorite dish was the chickpeas and eggplant. It was amazing. I think Seth’s favorite was the black eyed-peas. The kind of fun/quirky thing about having Vegan Drinks there is that the restaurant doesn’t serve alcohol, but you can bring your own and there’s no corkage fee. We’ve really enjoyed both times the meet up has been there. The staff is incredibly accommodating and friendly.